Many parents limit children to eating all-natural organic foods - but all-natural organic has its limits and kids get sick. Yet no parent with a child in danger of perishing would tell a doctor "use only organic" - they would insist on modern remedies. And once the child is feeling better, then it's back to all natural organic foods - a hybrid of organic and modern methods. The problem with organic lawn care is that when the lawn is in danger of perishing, you are limited to use only organic. And the lawn perishes. Conventional Lawn spraying is actually a hybrid of all-natural organic and modern remedies. 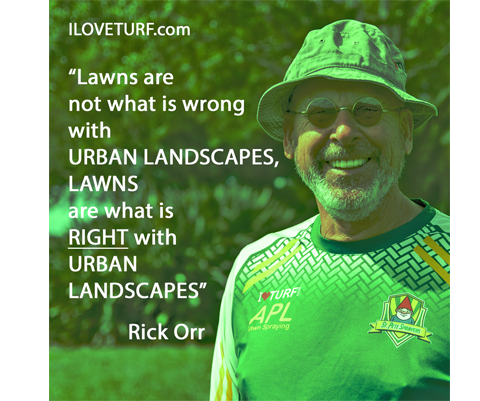 I use mostly all-natural organic - when it is working it is the best for the lawn. However when there is a problem, I can switch to my modern remedies, solve the problem quickly and then return to all-natural organic. Two of the three most critical all-natural organic methods of lawn spraying are not lawn spraying at all but are cultural practices. The third all-natural organic method is to create compost to feed the St Augustine grass. 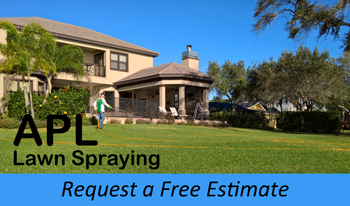 These all-natural organic methods are much like eating organic foods and exercising to keep you healthy, the all-natural organic methods of lawn spraying are intended to keep your lawn healthy. Keep Your St Augustine Lawn Moist with Good Irrigation - Water is the fuel that runs your lawn - no water, no lawn. If your lawn has enough water, it thrives, reproduces, recovers from stress and fights off disease and insects. A lawn under water stress is much like a person in the desert without water - struggling, parched and dying. Soon the critters that take advantage of such opportunities will attack and destroy. Keep the Canopy Tall - Mow your lawn as high as the mower can go. St Augustine has a unique growth habit that requires a tall canopy of leaves above to protect stems and roots from drying. Feed the Soil - I keep the soil fertility medium to medium high - I do not feed the plants. I feed the soil by adding raw minerals that are used by microscopic single cell organisms to metabolize for energy. The by-product of single cell organisms metabolizing raw elements is compost - the perfect food for you lawn. 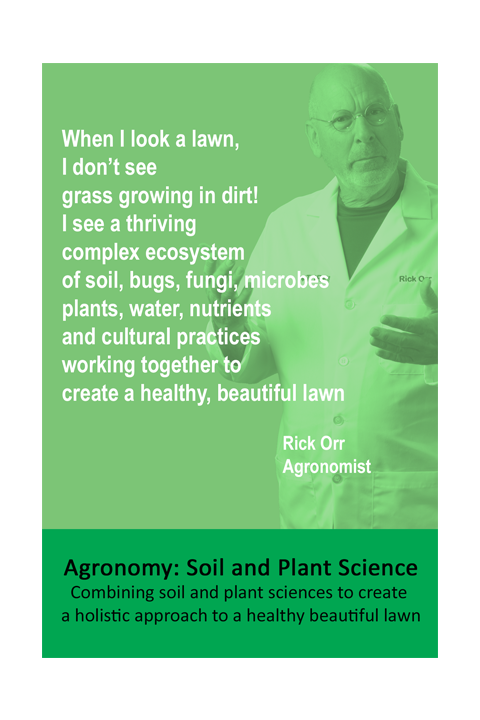 How Lawn Spraying Feeds the Soil - When we spray your lawn the mix has all the magic. In the mix are all-natural minerals that coat the leaves of the lawn. The leaves become mineral enriched organic food that feed the soil with every mowing. It's a simple all natural organic way to feed the lawn. Using the all-natural organic methods of keeping your lawn moist, the canopy tall and soil feed, you will have no chinch bug problems and few if any weeds.The lawn will look great and provide a beautiful setting for your home and little else is required. Unless there is a failure to water, keep the canopy tall or maintain the fertility. Chinch bugs attack water stressed lawns - no amount of proper watering, mowing or soil fertility will stop chinch bugs once they invade. The solution is an insecticide. I use synthetic botanicals to control chinch bugs. Synthetic botanicals are all-natural organic insecticides found in chrysanthemums that are manufactured in the laboratory. They are non-toxic and environmentally safe but since they are manufactured, they are not considered all-natural organic. Unlike all natural organic insecticides, there are no all natural organic selective herbicides. Sure there are organic compounds that kill plants, but they kill St Augustine too! However the chemical engineers have developed compounds that target specific chemical processes in specific plants. The compounds are non-toxic, used in very small amounts and safe for the environment. Are they organic? No! Are they safe? Yes! Do we use them? On a very limited basis - usually in lawns that are water stressed with a short canopy. Organic Weed Control - There is nothing better for weed control than a moist, tall stand of St Augustine growing in a rich fertile soil. Few if any weeds can invade such a lawn. If they do, they will struggle to survive and will often die trying. Getting rid of weeds doesn't make your lawn better but making your lawn better will get rid of weeds. There are no lethal fungi that will attack and destroy a lawn. Fungi 's job is to breakdown and recycle dead and dying tissue. A healthy, moist, tall fertile patch of St Augustine is not dead nor is it dying does not fear fungi. St Augustine has a symbiotic relationship with fungi in the soil to recycle those mineral rich leaf cuttings every time you mow. Organic fungus control is simple: Water often, keep it tall and keep the soil fertile. Does APL Use Organic Methods? We use a hybrid of organic and conventional lawn spraying. We encourage you to water often and mow as high the mower will go (organic). We will maintain the fertility at medium to medium high by feeding the soil (organic), kill the bugs in the warm months using synthetic botanicals (conventional) and work on the weeds all year long by treating the weeds we see, when we are there (conventional). The hybrid of organic and conventional lawn spraying is safe for you, your pets and the environment and produces a beautiful lawn.